Yes, comrades, we need to talk about crises again, the term recession simply does not explain what is really going on! Just in case you might not have noticed or perhaps the mainstream media where you live ignored it, the obvious has happened and the end of the so-called recession has disappeared into the fantasy novel. Once again there is a slowdown in growth and the financial markets are not particularly happy. This time, Germany and China are showing signs of slowdown. Globalisation has not ended the potential towards crises in the capitalist economic system; in fact, the greater interconnectedness of the world economy has exacerbated the situation and ensured that the contagion spreads. For those who believe the fantasies of neoliberal economics, the shock of these latest failures of neoliberalism must come as a surprise. But for those of us that have been warning of the stupidity of squeezing wages and destroying work conditions, rising inequality in income and wealth, the dangers of export-led growth when wage incomes are being squeezed meaning that unless governments become the sole purchasers of goods and services that are being produced (and they are not) that obviously there comes a point when working people cannot purchase goods and services as their incomes are too low, wiping out of savings has happened and personal indebtedness leads to default and bankruptcy. Neither of these things helps to maintain capitalist growth, accumulation and profitability in the long run; forget that, it hasn’t even lasted in the short run. I will be giving a run through on what is going on and why our lives feel as though we are living through the Shock Doctrine (which we are) then address the proposals of dealing with persistent unemployment under capitalism from the Left on which there is significant disagreement. Disclaimer: This forum rules as do the moderators. You know who I am talking about. Maybe others are unaware of this? I don’t know. It doesn’t matter though; the uninformed shouldn’t dictate fantasy as reality in a reality based community. This is the actual reality and why we are worried about a global financial calamity with regard to a possible political default on the public debt, which is a choice and otherwise impossible for a sovereign currency issuer. THE PRESIDENT: Look, here’s my expectation – and I’ll take John Boehner at his word – that nobody, Democrat or Republican, is willing to see the full faith and credit of the United States government collapse, that that would not be a good thing to happen. And so I think that there will be significant discussions about the debt limit vote. That’s something that nobody ever likes to vote on. But once John Boehner is sworn in as Speaker, then he’s going to have responsibilities to govern. You can’t just stand on the sidelines and be a bomb thrower. You know, we on the left knew what this would lead to. You don’t trust John Boehner with the full faith in credit of the United States unless one is completely clueless or an economic nihilist. The resulting signs we are starting to see of a financial panic in response to the prospects of a default on top of the ongoing depression, the jobs crisis, the continuing climate and ecological crisis all converging into one huge Epochal crisis, point to a special kind of disdain for the public that all our elected leaders have for us. I mean, we have enough problems without adding to them through a self induced global financial then economic crisis caused by the President’s pursuit of a deficit terrorist grand bargain whether through incompetence or outright corruption. As you might have heard the economy is contracting while unemployment remains high inching higher especially in real terms again while Washington is too stupid or corrupt across the board to notice. I can’t say I didn’t see this coming even as just an above average layman. All this focus on austerity is detrimental. After all, spending is actually income and so are deficits which are the life blood of the private sector in the economy when it comes to those sectoral balances you hear me always harping about. And on that point I refer to Post Keynesian economist Wynne Godley as he along with MMT economist L. Randall Wray predicted this crisis in 2000 and that matters. Therefore it’s safe to say the Post Keynesian school is pretty much vindicated. And part of this tradition can be read in Forbes magazine every month. Imagine that! I have thanks to discovering the work of the most excellent Post Keynesian/MMT economist John T. Harvey. I have to thank NY brit expat for introducing me to John whom is not only a brilliant economist, but an all around cool guy who is very approachable and has an awesome taste in music. He stresses that the economics discipline hasn’t made economics very understandable to the general public and he’s right; however, you wouldn’t know that by reading his many excellent pieces on why everything people think they know about debt and deficits is absolutely wrong. As John points out, it’s not only wrong, it pervades this entire ignorant and corrupt political debate happening right now over this stupid sequester that was a creation of the White House and Congress. As you will read down below, this horrible self induced debt ceiling pro austerity political show where never is heard an encouraging word like full employment, but instead for Peter Peterson’s enjoyment, idiotic words praising deficit terrorism(budget balance and cutting our safety net) rule the day. It only amounts to economic decay and a likely recession on the way depending on how much deficit spending is cut in the coming days. Democratic Connecticut Governor Dannel Malloy (@GovMalloyOffice) joined the panel on Up with Chris Hayes to discuss the untold story of the Great Recession: how cash strapped states and local governments are dealing with the aftermath of the financial crisis and how they could be affected by the outcome of so-called “fiscal cliff” negotiations. Host Chris Hayes, along with Gov. Malloy, talk about austerity on the state level cash strapped states resort to extreme measures to balance their budgets and the different way states are finding to raise cash. They are joined in the discussion by Elizabeth Pearson, fellow at The Roosevelt Institute; Maya Wiley (@mayawiley), founder and president of the Center for Social Inclusion; Veronique de Rugy (@veroderugy), senior research fellow at the Mercatus Center at George Mason University; and Dedrick Muhammad, senior economic director at the NAACP. The Dow Jones industrial average finished the day down 1.8 percent, or 243.36 points, to end at 13,102.53, its worst performance since June. The losses added to the big declines on Friday, and dropped leading indexes to their lowest levels since early September, before the Federal Reserve announced its latest monetary stimulus program. Since the Standard & Poor’s 500 index hit this year’s high of 1,465.77 on Sept. 14, the benchmark index has fallen 3.6 percent. It finished Tuesday down 1.4 percent, or 20.71 points, to 1,413.11. Share futures were falling even before the opening bell because of disappointing financial results from American companies. The chemical maker DuPont said Tuesday morning that its revenue was down 9 percent in the third quarter from a year ago, and that it would eliminate 1,500 jobs. The company’s stock ended down 9.1 percent. Thomson Reuters said Tuesday that 63 percent of the companies that have reported earnings so far have given revenue figures for the third quarter that were lower than what analysts expected. The stock market is freaking out like Bill Paxton’s panicky marine in “Aliens,” yelling “Game over, man! Game over!” All because it’s afraid of losing Ben Bernanke. Late in the trading day on Tuesday, the Dow Jones Industrial Average was down more than 200 points, on track for its worst one-day loss since June. What had it in such a tizzy? There were lots of good reasons — third-quarter corporate earnings have been kind of awful, and Europe’s endless debt crisis continues. But the main catalyst, according to Wall Street‘s best and brightest, are a couple of New York Times stories today, one by the well-sourced Andrew Ross Sorkin, suggesting that Federal Reserve Chairman Ben Bernanke probably won’t sign up for another term when his second term as Fed Chairman ends in January 2014. Binyamin Appelbaum runs through a handful of the possible replacements in a Mitt Romney administration, and at least one of them — Stanford’s John Taylor — is known to be opposed to Bernanke’s easy-money policies. Of course the idea that Bernanke might be leaving should shock nobody, really. After eight years of riding herd on the worst economic crisis since the Great Depression, all the while being accused of treason and threatened with old-fashioned Texas lynchings, did anybody really expect that Ben would want another four years of this? Apparently so. The market indeed seems shocked and horrified by the idea that it will no longer be able to depend on what’s come to be known as the “Bernanke Put” — the implied promise that Bernanke won’t let the stock market fall too far before riding to the rescue with another helicopter-load of money. Sounds like a combination of the continued recession at the bottom of the economic stratus is trickling up to the top, at last, and the poor dears on Wall St. are concerned that they’re losing their “sugar daddy”. Tell me again why they hate Obama? Doing the same thing repeatedly and expecting different results is the definition of insanity. It then must follow that Germany’s Chancellor, Andrea Merkel has got to be insane. S&P said austerity was driving Europe even deeper into financial crisis as it also cut Austria’s triple-A rating, and relegated Portugal and Cyprus to junk status. The humiliating loss of France’s top-rated status leaves Germany as the only other major economy inside the eurozone with a AAA rating, and rekindled financial market anxiety about a possible break-up of the single currency. S&P brought an abrupt end to the uneasy calm that has existed in the eurozone since the turn of the year by downgrading the ratings of Cyprus, Italy, Portugal and Spain by two notches. Austria, France, Malta, Slovakia and Slovenia were all cut by one notch. The agency said that its actions on eurozone ratings were “primarily driven by insufficient policy measures by EU leaders to fully address systemic stresses”. It added that fiscal austerity alone “risks becoming self-defeating“. Germany,too may be facing a downgrade as it slips into recession as its economy is contracting in the face of the deflationary economic policy of the euro zone. So what does Frau Merkel do? You got it, more austerity. German Chancellor Angela Merkel said Standard and Poor’s downgrades of nine countries underline the fact that the eurozone faces a “long road” to win back investors’ confidence, pushing Saturday for it to move quickly on a new budget discipline pact and a permanent rescue fund. I agree with Chris in Paris at AMERICAblog that the ratings agencies should be rendered useless considering their part in the current economic crisis but they are right about austerity. The Europeans led by Merkel are ignoring reality. For most Americans the recession never ended as was shown in a study (pdf) done by two former Census Bureau officials, Gordon W. Green Jr. and John F. Coder and explained in the New York Times article by Robert Pear. The household income has continued to drop over the last two years even though the Village has declared that the recession ended in June, 2009. Between June 2009, when the recession officially ended, and June 2011, inflation-adjusted median household income fell 6.7 percent, to $49,909, according to a study by two former Census Bureau officials. During the recession – from December 2007 to June 2009 – household income fell 3.2 percent. In their new study, Mr. Green and Mr. Coder found that income dropped more, in percentage terms, for some groups already making less, a factor that they say may have contributed to rising income inequality. From June 2007 to June of this year, they said, median annual household income declined by 7.8 percent for non-Hispanic whites, to $56,320, and by 6.8 percent for Hispanics, to $39,901. For blacks, household income declined 9.2 percent, to $31,784. The study also looks at unemployment, types of jobs, wages, age and education factors in the decline. More striking still is the huge erosion in incomes over the course of the supposed “recovery” – the most recent two years, since the Great Recession ended. 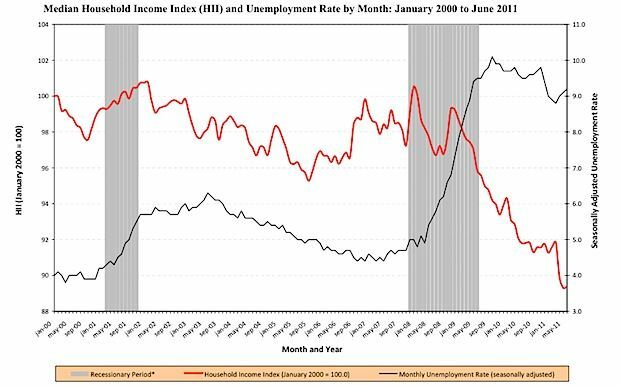 From January 2000 through the end of the recession, household incomes fluctuated, but basically stayed in a band within 2 percentage points either side of the 98 level. Once it had fallen to 96 when the recession ended, it would have been reasonable to assume some mean reversion at that point – that with the recovery it would fight its way back up towards 98 or even 100. In dollar terms, median household income is now $49,909, down $3,609 – or 6.7% – in the two years since the recession ended. It was as high as $55,309 in December 2007, when the recession began. Anyone still wondering what is motivating Occupy Wall Street at this point need only to look at this study by Green and Croder.